Cummins Engine Company re- cently introduced the first Marine models of its new B and C Series of lower horsepower diesels, which will expand Cummins Marine product line to 61 horsepower on the low end. The B Series propulsion engines will consist of four and six-cylinder models with displacement of 3.9 and 5.9 liters, covering 76 to 152 horse- power, rated 2,500 rpm for intermit- tent duty and at 2,800 rpm for maxi- mum duty. These engines are capa- ble of providing main propulsion power in a wide variety of marine applications. Cummins has the 2,500-rpm B Series available now. The C Series propulsion engines, available in the second half of 1986, consists of six-cylinder engines with a displacement of 3.8 liters, ranging from 158 to 204 horsepower. Cummins is also introducing a completely new line of Marine aux- iliary generator drive engines. Ini- tially, B Series products rated at 61, 82 and 97 brake horsepower at 1,800 rpm will be available. Higher and lower horsepower ratings will be made available in the near future. 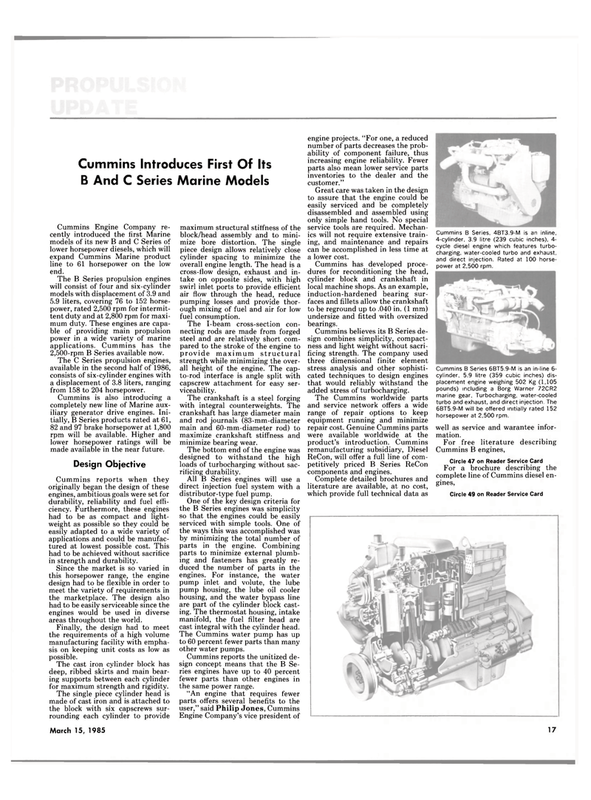 Cummins reports when they originally began the design of these engines, ambitious goals were set for durability, reliability and fuel effi- ciency. Furthermore, these engines had to be as compact and light- weight as possible so they could be easily adapted to a wide variety of applications and could be manufac- tured at lowest possible cost. This had to be achieved without sacrifice in strength and durability. Since the market is so varied in this horsepower range, the engine design had to be flexible in order to meet the variety of requirements in the marketplace. The design also had to be easily serviceable since the engines would be used in diverse areas throughout the world. Finally, the design had to meet the requirements of a high volume manufacturing facility with empha- sis on keeping unit costs as low as possible. The cast iron cylinder block has deep, ribbed skirts and main bear- ing supports between each cylinder for maximum strength and rigidity. The single piece cylinder head is made of cast iron and is attached to the block with six capscrews sur- rounding each cylinder to provide maximum structural stiffness of the block/head assembly and to mini- mize bore distortion. The single piece design allows relatively close cylinder spacing to minimize the overall engine length. The head is a cross-flow design, exhaust and in- take on opposite sides, with high swirl inlet ports to provide efficient air flow through the head, reduce pumping losses and provide thor- ough mixing of fuel and air for low fuel consumption. The I-beam cross-section con- necting rods are made from forged steel and are relatively short com- pared to the stroke of the engine to provide maximum structural strength while minimizing the over- all height of the engine. The cap- to-rod interface is angle split with capscrew attachment for easy ser- viceability. The crankshaft is a steel forging with integral counterweights. The crankshaft has large diameter main and rod journals (83-mm-diameter main and 60-mm-diameter rod) to maximize crankshaft stiffness and minimize bearing wear. The bottom end of the engine was designed to withstand the high loads of turbocharging without sac- rificing durability. All B Series engines will use a direct injection fuel system with a distributor-type fuel pump. One of the key design criteria for the B Series engines was simplicity so that the engines could be easily serviced with simple tools. One of the ways this was accomplished was by minimizing the total number of parts in the engine. Combining parts to minimize external plumb- ing and fasteners has greatly re- duced the number of parts in the engines. For instance, the water pump inlet and volute, the lube pump housing, the lube oil cooler housing, and the water bypass line are part of the cylinder block cast- ing. The thermostat housing, intake manifold, the fuel filter head are cast integral with the cylinder head. The Cummins water pump has up to 60 percent fewer parts than many other water pumps. Engine Company's vice president of engine projects. "For one, a reduced number of parts decreases the prob- ability of component failure, thus increasing engine reliability. Fewer parts also mean lower service parts inventories to the dealer and the customer." Great care was taken in the design to assure that the engine could be easily serviced and be completely disassembled and assembled using only simple hand tools. No special service tools are required. Mechan- ics will not require extensive train- ing, and maintenance and repairs can be accomplished in less time at a lower cost. Cummins has developed proce- dures for reconditioning the head, cylinder block and crankshaft in local machine shops. As an example, induction-hardened bearing sur- faces and fillets allow the crankshaft to be reground up to .040 in. (1 mm) undersize and fitted with oversized bearings. Cummins believes its B Series de- sign combines simplicity, compact- ness and light weight without sacri- ficing strength. The company used three dimensional finite element stress analysis and other sophisti- cated techniques to design engines that would reliably withstand the added stress of turbocharging. ReCon, will offer a full line of com- petitively priced B Series ReCon components and engines. Cummins B Series, 4BT3.9-M is an inline, 4-cylinder, 3.9 litre (239 cubic inches), 4- cycle diesel engine which features turbo- charging, water-cooled turbo and exhaust, and direct injection. Rated at 100 horse- power at 2,500 rpm. Cummins B Series 6BT5.9-M is an in-line 6- cylinder, 5.9 litre (359 cubic inches) dis- placement engine weighing 502 Kg (1,105 pounds) including a Borg Warner 72CR2 marine gear, Turbocharging, water-cooled turbo and exhaust, and direct injection. The 6BT5.9-M will be offered initially rated 152 horsepower at 2,500 rpm. well as service and warantee infor- mation.